The healing power of light therapy. Introduction to light therapy What is dawn simulation? Light therapy can be a attractive solution for many. The coming of the winter can be a difficult time. Personally speaking it takes me a little while to get used the fact that it gets darker earlier. Especially if the summer has not been that great weather wise. The role of light in our lives and how it contributes to our well being is very much underestimated today in our society in my humble opinion. We need and must have light... without it...we cannot function. 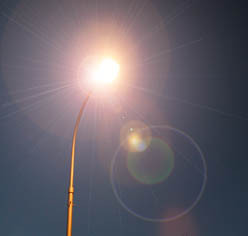 Most of the existence of life on our planet is fueled by light. Plants use sunlight in order to turn air into sugar this process is known as photosynthesis. By using these sugars it allows them to grow. Animals use sunlight indirectly by eating plants and directly by eating animals. Sugars and molecular components that the plants produce are broken down and stored solar energy released. It gives the animal energy to survive. The process is called respiration. Lack of sunlight can lead to a lack of vitamin D. This in turn can lead to rickets and other illnesses. Research shows bright light can change brain chemistry. The amount of light we receive through our eyes stimulates our brain nerve centers. A substance known as melatonin is produced by our pineal gland. Melatonin tells our body clock that its night. On dark winter days there is sufficient light to activate the wake up process. Light is linked to 5HT (also known as serotonin.) This is a neurotransmitter in our brain. Bright light increases serotonin levels, it is interesting to note that prozac has the same affect. Research has shown in the US and abroad that light therapy treatment has been successful in treating Seasonal affective disorder patients. Improvement usually takes about a week sometimes sooner. Now for the downside, symptoms return quickly, usually about a week if the lights are withdrawn. So to me it makes sense to stick with the treatment. A brightly-lit climate will relieve symptoms, if that is not possible then a bright light can be used. The light should be on the same level of brightness, as a clear spring morning. Thirty minutes a day can be enough to relieve the symptoms. It is not necessary to stare into the light. It is just necessary for the light to reach the eyes.